1. Young and / or bad and self-righteous parents with strollers in tow, and obese-people blocking our paths when we are running; 2. Anything flapping from our body when we run (hair, clothes, flesh etc); 3. Having to run as Michelin Men in Winter; 4. Why we have to pay so much for good crisp bubbly in this isle; 5. Why we have to pay so much for seafood in this isle (and it is an isle! ); 6. Pollution from the traffic 7. The taste of Nondon tap water; 8. Dogs and more so, dog-owners who, like parents, have the stench of smugness (‘I am sure the whole world ALSO adore my cute dogs/kids! Look at their envy!’) when we want to shout to them: ‘Leash up your bloody poodles and please wipe up their poo and your silly smile when you let them run after runners’; 9. Short men aggressively pumping iron in the gym; 10. Middle-aged men. This post is about the final point. Specifically, we are drawing your attention to 3 exceptions from the media world to this final point: they are our beloved, in no particular order: 1) Jon Snow 2) Jeremy Paxman 3) Clive Anderson. (Actually, 3.5, if we include 3.5: Ken Livingston since he appears often enough in our favoured Have I Got News For You, we can consider him as a media figure and hence save our arses and stay clear of politics). Hence, when the opportunity came up for a chance to catch THE UBER-BRILLIANT Clive Anderson in the flesh, we jumped at it. 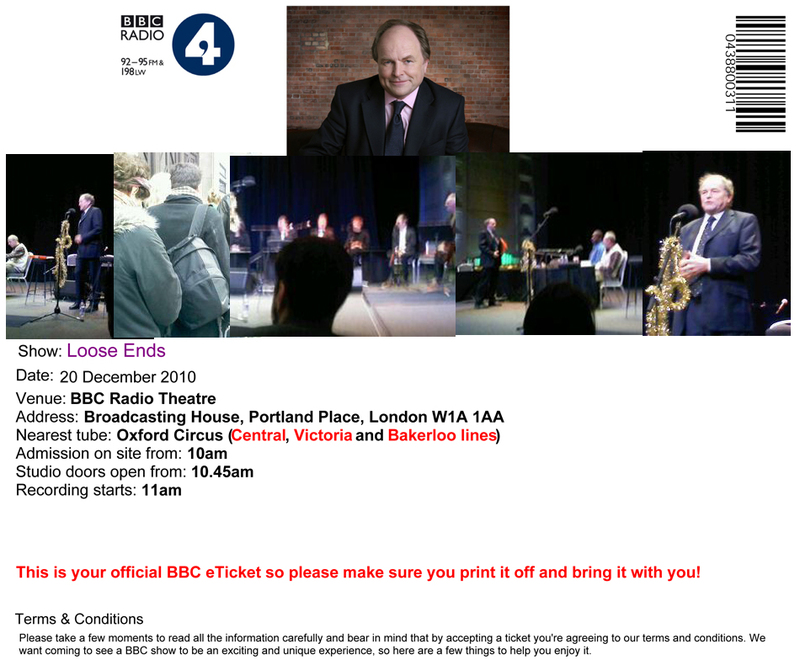 On 20 December 2010, Monday 11am, in conditions described over and over again as ‘arctic’ by the media, we visited the BBC Radio Theatre in Central Nondon, to be ‘live’ audiences of the Radio 4 programme Loose Ends. (This is not the first time we attended BBC events – previously we had risked ill health and visited BBC to catch a glimpse of another middle-aged man we fancy, Grayson Perry, with CFTE [Companion For The Evening]). As expected Clive Anderson was bantering, at top speed, first thing he stepped onto the stage. As expected in a way as well, Clive was not 6feet4 (and we say this being seated in the second row, but at least he was not pumping iron). As this recording was to be broadcast on New Years day, Anderson urged us to sound merry. So we did, clapping and cheering wildly. We were treated to music by a ukulele band, and appearances by guests from television and theatre. It was good fun, compactly packed in a single hour. Watching the superbly intelligent and witty ex-lawyer ‘live’, unedited yet ever-so-brilliantly sharp, reminded us why we admire him. At the end of the show, we wanted to approach Anderson – while he was still lingering on stage, and we a couple of yards (whatever a yard is) away, yet not close (or civilised for us) enough for us to shout. Unfortunately, one of the ushers -in black of course- prevented us from doing that, in a firm tone. We repeated our requests, and the usher did too, in a firm voice ‘of authority’. This unleashed an unpleasant memory from a previous life, when we had an experience of our lifetimes when we underwent layer after layer of interrogation (and patting down, and ransacking of our bags inside out, et al) when we were boarding and leaving the El Al to attend a lovely film festival. We glared at the lady, silently. We left the studio and stomped our icy feet on the icy ground. Meeting, yet not quite meeting -is that not what Nondon excels in? This entry was posted on Friday, January 21st, 2011 at 10:00	and is filed under REALITY CHECK and tagged with imagination, london, nondon. You can follow any responses to this entry through the RSS 2.0 feed. You can leave a response, or trackback from your own site.